Custom fields let you capture data specific to your business needs. 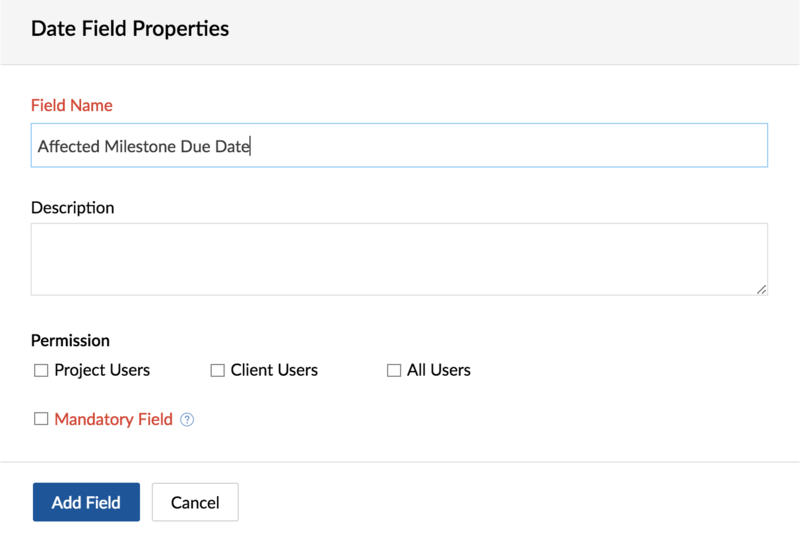 Create custom fields in issue tracker and collect data relevant to the issue. Click to learn more on access privileges for Issue Custom Fields. Default fields cannot be removed from the layout. Some fields can be modified as per business requirement. 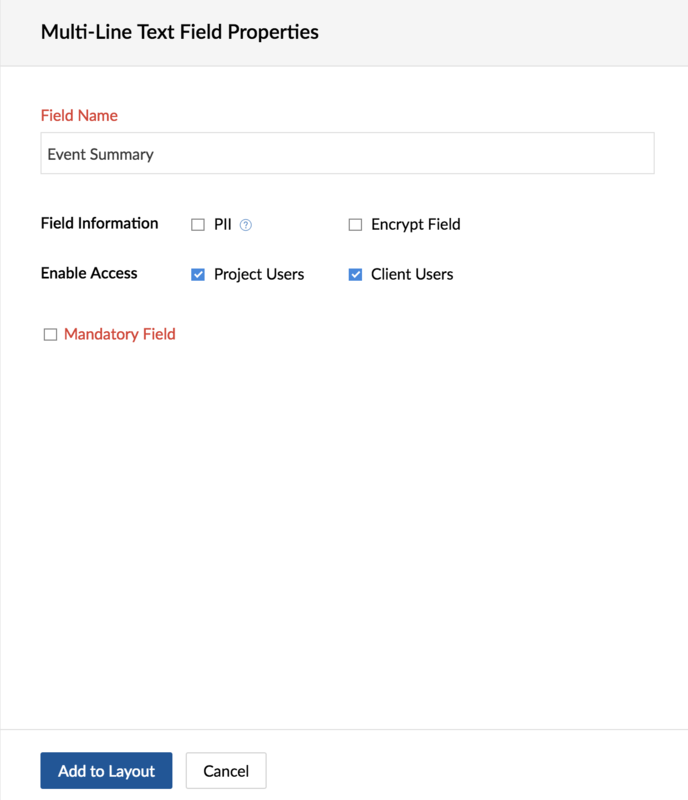 Navigate to > Issue Tracker > Customization > Fields. Change the default status for an issue under Set Default Status section. Click the +Add Status link to create a new issue status. 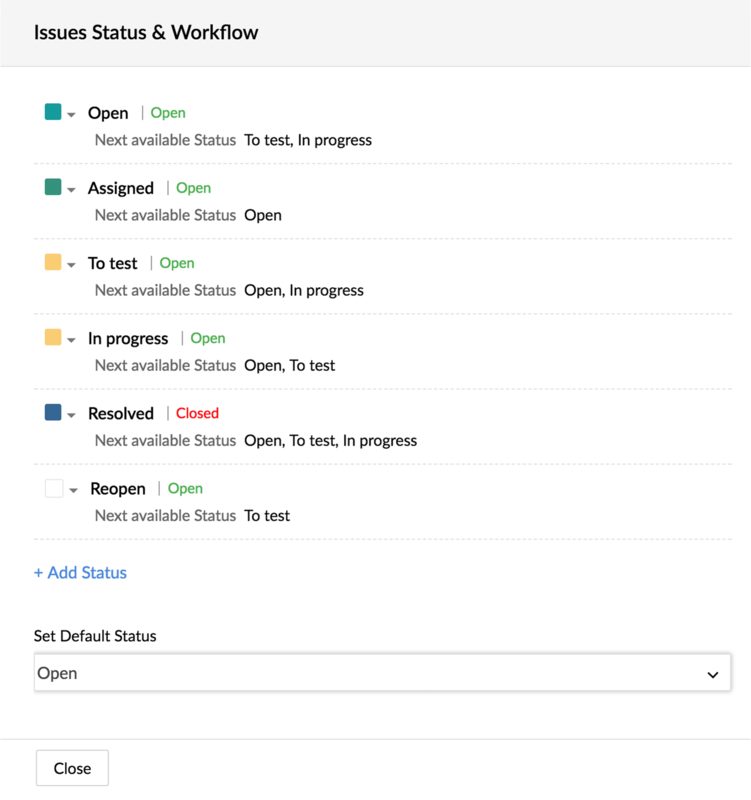 A new status will fall under either Open or Closed status types. Default Status can't be deleted and there should be at-least one open & one closed status. Click or to the left of the status name to assign a color. Pick any color from the palette that matches the status name and type. 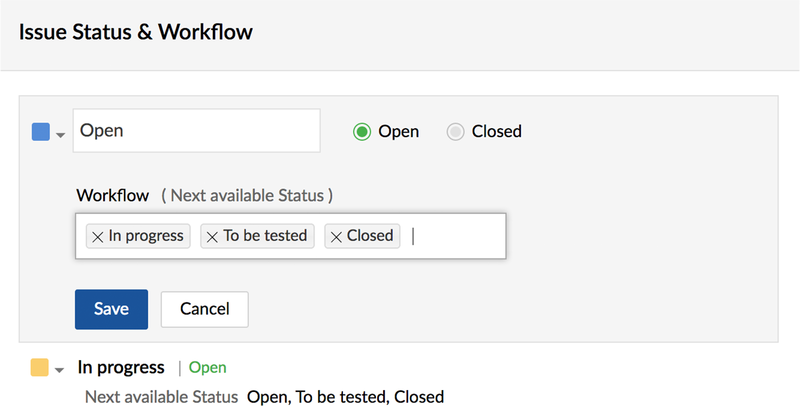 Define a Workflow by selecting the next available status. The workflow is determined by the next available status specified in the box. Click Save to add the Status. 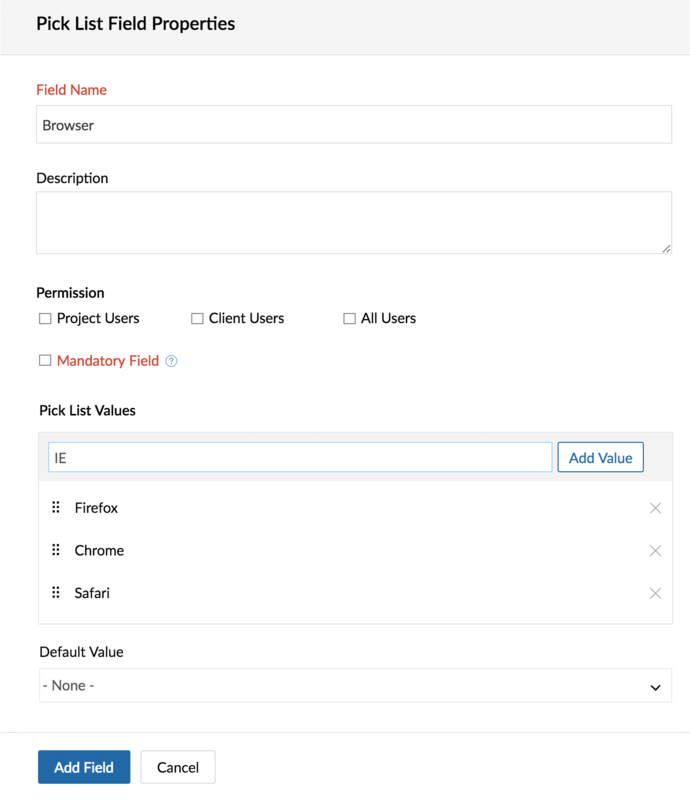 Navigate to Issue Tracker > Customization > Fields. Drag and drop a field type from the New Fields tray into the layout editor (main panel). Single-line text field: Add just a line of text. Multi-line text field: Add multiple lines of text. Hit Enter to key in more information. 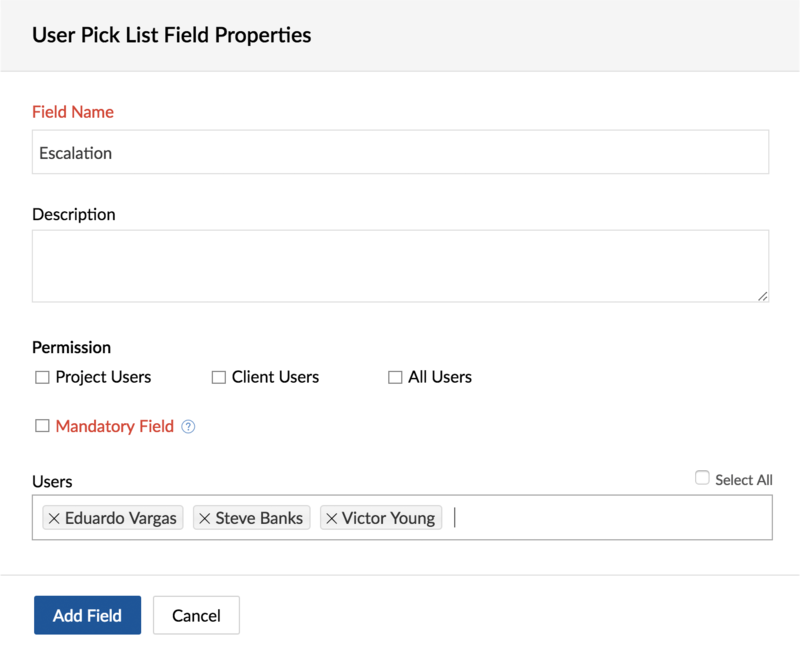 Pick List field: Create your own drop down using a pick list. Set values and wrap them under a pick list as per your business needs. User Pick List field: Use this field when you have to store usernames. Date: Store dates in this field. Click Add Field to include the field in the layout. Cancel will discard the field. A maximum of 30 custom fields can be created. Removing a field’s association from the layout will not result in data loss. But, deleting a field from the portal will delete the data. Drag and drop the Single-Line Text field from the New Fields tray into the layout editor (main panel). Enter a Field Name. The field name is mandatory and must be unique. Set Permission for a user group. Set a Default Value and make the field mandatory if necessary. Single line text fields can be marked as containing Personally Identifiable Information (PII). If you select Encrypt Field, the data will be encrypted at the backend. Drag and drop the Multi-Line Text field from the New Fields tray into the layout editor (main panel). Enter a Field Name. The field name is mandatory and unique. Multi-line text fields can be marked as containing Personally Identifiable Information (PII). If you select Encrypt Field, the data will be encrypted at the backend. Drag and drop the Pick List field from the New Fields tray into the layout editor (main panel). Add values. A pick list cannot be empty. Enter valid data in the editable text area and click Add Value. Click next to the value to remove it. Select a Default Value and make the field mandatory if necessary. Drag and drop the User Pick List field from the New Fields tray into the layout editor (main panel). Make the field mandatory if necessary. Drag and drop the Date field from the New Fields tray into the layout editor (main panel). Drag and drop the Number field from the New Fields tray into the layout editor (main panel). Number fields can be marked as containing Personally Identifiable Information (PII). 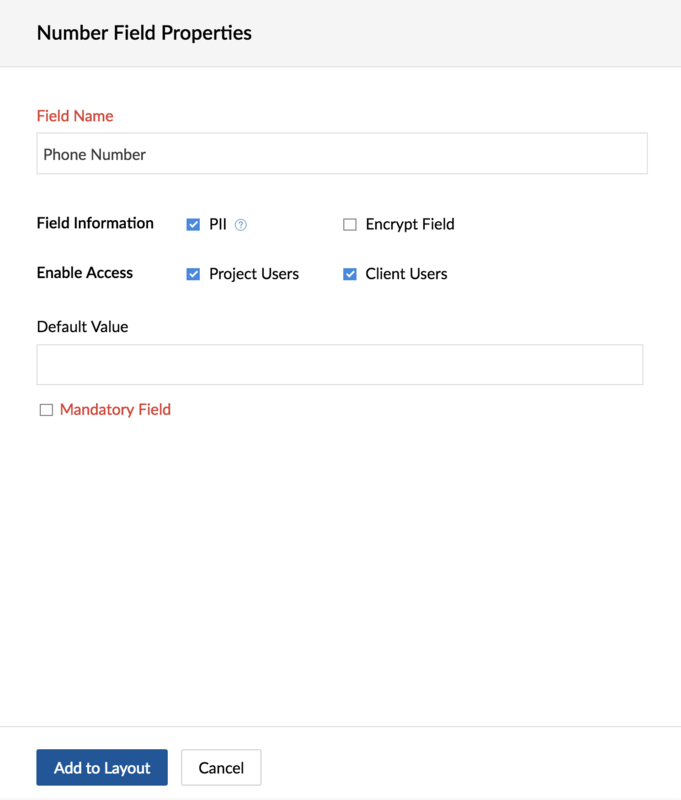 If you select Encrypt Field, the data will be encrypted at the backend. Hover over the custom field you would like to edit. Click the pencil icon . Custom fields can be edited only in Enterprise plan. Hover over the custom field you would like to remove. Click the cross icon . Removing a field from a layout will not permanently delete it from the database. It will be moved to the Available Fields tray and it can be reused later. The data stored in the field will not be lost. Click the Delete Field button in the upper-right corner of the page to permanently delete the field.